I remember saying that I was going to jump back in on some big IPA's, but yet here I am with another cheap lager. This is the national lager of Laos, a small south-east asian country. It's a hot and humid climate so I'm expecting a nice refreshing lager. This beer is incredibly popular in both Laos and Thailand with locals and tourists alike. The beer is slowly gaining a reputation abroad as tourists come back with stories of this beer. It's never quite as good as you remember it back home, but still this is a beer that reminds people of good times they had overseas. Beerlao leaves a little to be desired in terms of appearance. The beer is on the yellow side, with a large number of bubbles rising to a less than impressive white head. The head dissipates very quickly and doesn't leave any sign of ever being there, absolutely no lacing and not even a ring of foam around the top of the beer. This isn't a huge issue though, as this is most commonly consumed in the bottle. Like almost all lagers from this region, Beerlao has a very mild odour. This one has some complexities however when you really concentrate. There are hints of citrus on the nose as well as a relatively thin smelling grain. I can't smell alot of hops, but this (hopefully) doesn't mean that there aren't any. It's not a bad nose that will turn people off but it certainly won't entice people either. After quite a disappointing start I'm pleased to report that Beerlao tastes quite alot better than either the appearance or smell would suggest. The beer has a really clean malt base and a surprising ammount of nice spicy hops. They may not be the most bitter of hops, but they provide more than enough bite to make this beer refreshing. The light carbonation and dry mouthfeel really enhance this beers reputation as a great thirst quencher. 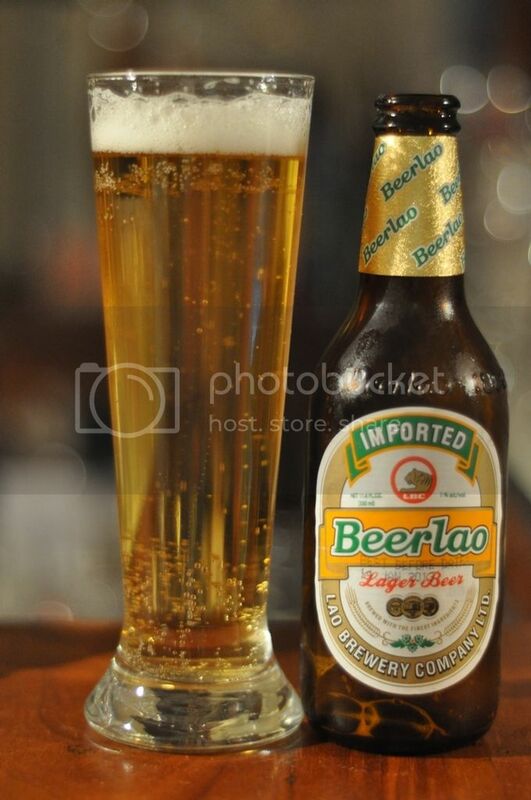 Overall Beerlao is nice refreshing lager, which is surprisingly enjoyable to drink. Obviously this beer would be better if I was sitting by the Mekong river in Laos, but for a cold winters evening in Melbourne it's a nice lager. It drinks literally like water, one of the easiest to drink beers I've ever had the pleasure of sampling. This is definitely one for summer!